Every day a person gets older, and on one of those every days, a person is going to get ill. At some point, one of those days will be the day a person finds out they cannot or should not live without ancillary care. Wise investors have prepared for such eventualities from a financial standpoint. But the question is whether their children are aware of the financial plans that have been made to prepare for the days when a family member is old and/or sick, and what desires that person has regarding future living arrangements. Surprisingly, many affluent investors have NOT had that talk with their children. Spectrem’s study The Convergence of Health and Wealth discusses some of the financial preparations affluent investors have or have not made in anticipation of the day when they are not 100 percent health of mind or body. But a key component of the study is the series of questions asking investors whether their children know of the plans they have made or the plans they have in mind for their future. Advisors should note that the same is true about investors and their financial professionals. Not every investor has fully informed his or her advisor about their plans for future health care and living arrangements. This is a conversation advisors can encourage in order to ensure the investor has thought of all contingencies and is properly prepared financially for what may come. According to the study, 56 percent of non-retired investors have issued a Medical Power of Attorney and 46 percent have offered a Financial Power of Attorney. Of that lot, only 58 percent have discussed with their children what their Medical Power of Attorney describes. The details of a Medical Power of Attorney are not the sort of thing that should come as a surprise, because the details are likely to come out at a time of stress, and the newly discovered details could cause additional pain and suffering. The study also asks investors what they think of their choices for future living arrangements including staying in their current home with in-home assistance or moving into a retirement or senior care facility at some point. All of the investors taking the survey answered the questions, indicating they have given the topic some thought, but 56 percent of non-retired investors have discussed their thoughts and plans about future care and living arrangements with their children. That percentage climbs to 68 percent among retired investors, but that still seems like a low percentage considering the stakes involved. Perhaps the investors don’t want their families to know they plan to move in with the kids when the time comes. 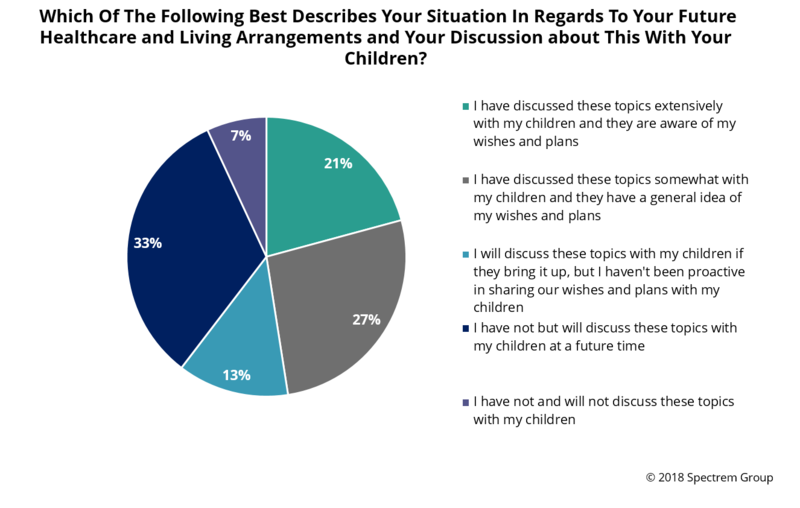 Perhaps this is telling: only 68 percent of retirees believe their children have any level of interest in discussing their parent’s future needs either financially or in terms of living arrangements. Too bad. The conversation needs to occur. It is possible an investor wants to keep his or her plans a secret for some reason. Perhaps they don’t want to be talked out of their plans, or they are embarrassed to admit none of their children will house them. Whatever the cause, advisors should at least try to broach the subject of an investor’s plans for living arrangements, assuming financial concerns have already been addressed. Advisors can provide direction from the experience with other investors about what living arrangement works best depending on the health care needs of the investor.